The edibly-landscaped rooftop garden at 107 Redfern Street was an appropriate venue for a workshop on food policy councils. THEY CAME from Darwin, Brisbane, the NSW North Coast, Sydney and as far south as Melbourne. What was it that would motivate food systems advocates to come all that way? It was this: the opportunity to attend a workshop with Eric Holt-Giminez, the director of the long-running US food advocacy organisation, Food First. Food First was founded in 1975 by Frances Moore Lappé, a food researcher and author of the popular 1971 book, Diet for a Small Planet. It emerged from the Institute for Food and Development Policy which she and Joseph Collins started in 1975. Food First was based on the idea that it was not a lack of food which caused hunger, rather the inability of people living in poverty to get access to it. Alana Mann was an organiser of the workshop. The workshop focused on the establishment and work of food policy councils. 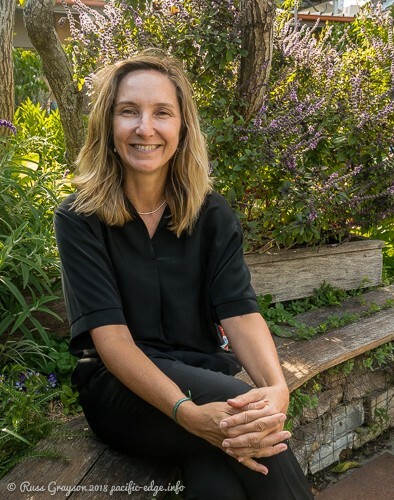 Alana Mann, a lecturer with the Department of Media and Communications at Sydney University; Alana is associated with the University’s Sydney Environment Institute. There were around 16 at the day-long event. They are among the core people, the influencers, the advocates, the researchers, the communicators behind Australia’s fair food movement. 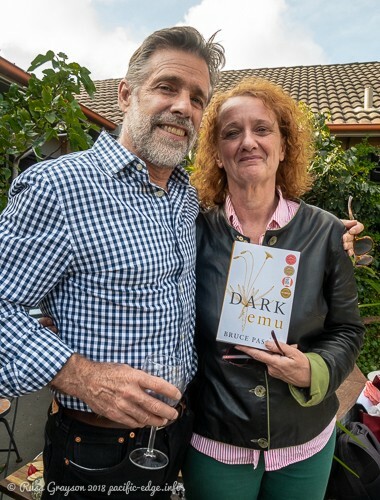 Catriona Macmillan presents Eric Holt-Giminez with a copy of Bruce Pascoe‘’s book, Dark Emu. The book describes how Australian Aborigines developed a form or agriculture and how their food culture was more than hunter-gatheriing. Food First’s Eric Holt-Giminez discussed the value of, and how to set up, food policy councils. The councils are alliances of varied interests in the food supply chain that perform educational, advocacy and advisory roles. 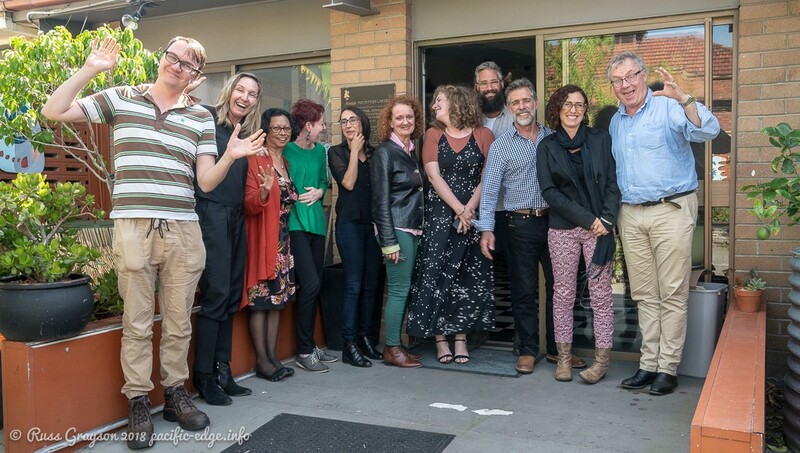 For Catriona Macmillan and I, the workshop harked back to our work with the Sydney Food Fairness Alliance a decade ago when a food policy council was on the agenda. The Alliance pioneered the idea of a food policy council in NSW. Formation of a council was called for at the culmination of the Alliance’s successful and well-attended 2009 Food Summit, the Hungry For Change conference. The conference produced a Declaration On Food (and here and background) that was presented to state government Labor and Greens MPs. The Alliance was active in calling for the preservation of urban fringe market gardens and orchards rather than paving them with urban sprawl. Retaining the city-edge rural land, the Alliance asserted, was vital to maintaining urban food security and the industry around Sydney’s fresh food supply. The industry is a major employer and provides the first employment experience in Australia for many immigrants. By taking a systems view of urban agriculture to include the industry around it and the people working within it, the Alliance offered a broader appreciation of urban food systems that that of focusing solely on farming. The future of urban fringe farmland has continued as a political and planning issue, however the Alliance has not continued. A few years ago it merged with a new, national food lobby, the Right To Food Coalition https://righttofood.org.au. 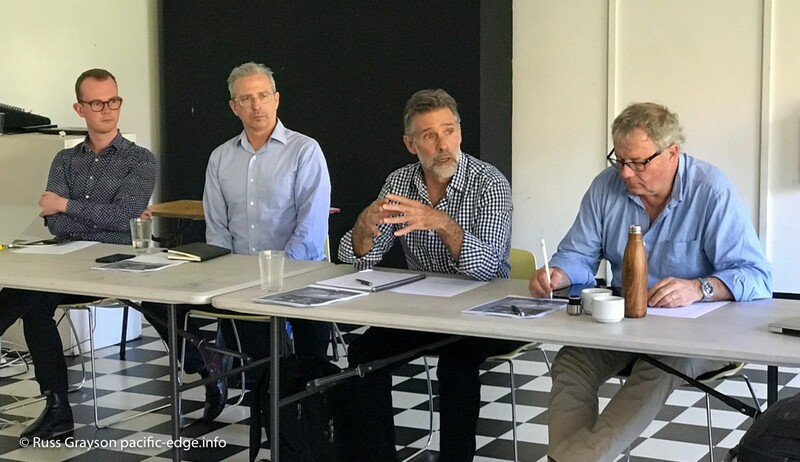 Flanked by Sydney Environment Institute staff and planner, Ian Sinclair (right), Eric Holt-Giminez engages with workshop participants. Like birds flocking to eat a farmers ripening grain, ideas around a fair food system that would benefit all participants, including eaters, as well as a food policy council flowed and coalesced. the context or our work is the public sphere. Those of us familiar with the organisation and dynamics of social movements will recognise how food movement fragmentation and too many issues can hold a movement back. It is a bit like watering a garden. Switch the hose nozzle to spray and out come numerous weak streams of water that have limited potential to feed the plants. Switch to a unified, solid stream and you have the potential not only to water the plants but to erode the soil they grow in. So could it be with a unified fair food movement eroding the foundations of the old model. That the movement is fragmented was a finding of research done several years ago when I was on a NSW government panel set up to consider future funding for community food systems. Now, other participants in the movement are saying the same thing. How bringing in someone with experience from outside can stimulate creative thinking. They bring their knowledge and experience and, perhaps, new ideas on moving towards goals. How the social movement around a better food system has grown and broadened since the days of the Sydney Food Fairness Alliance and the time when several people active in developing a better food system — Nick Rose (now leading the Australian food educational and advocacy organisation, Sustain), Brisbane Food Connect Foundation’s Robert Pekin (and here), a one-time dairy farmer, Joel Catchlove, a food advocate in Adelaide who was one of the crew that organised the Plains To Plate food convergence in 2013, and myself set up the Australian Food Sovereignty Alliance. How developing a food policy council and the work around doing that congeals the social movement around food and gives it political and social context. The day workshop complemented previous events organised by Alana Mann and the Sydney Environment Institute. It scaled-up the Institute’s work because it attracted people from interstate. That had much to do with Eric Holt-Giminez’s presence as well as with the idea of a food policy council. 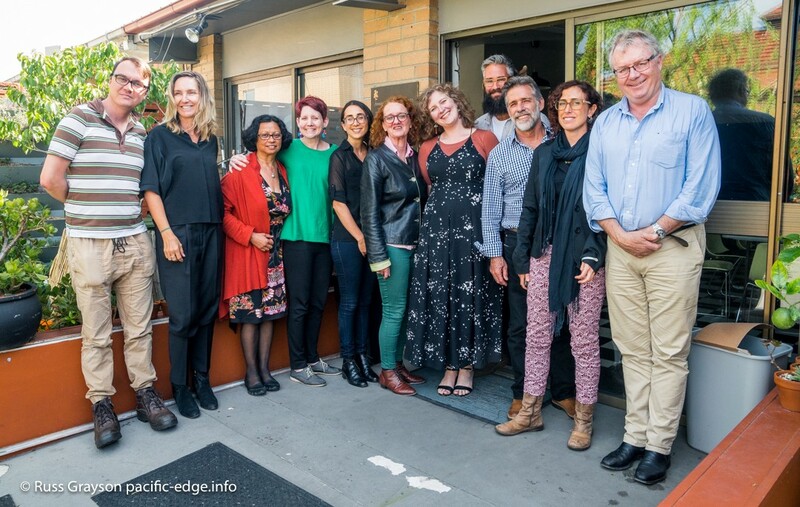 Going by the experience of the Sydney Food Fairness Alliance, it is possible that councils would be state-based, however there is space for a national body composed, perhaps, of people from state-based councils. The Alliance chose to limit its activity to the Sydney metropolitan area and adjacent region supplying the city with fresh food although the question of whether it should encompass all of NSW in its ambit came up from time to time. Just like many bricks are needed to erect a house, the event was a brick in building a more-effective fair food movement. The movement has grown from a supply-focus based on farming to a supply/demand focus encompassing growers, distributors and eaters is a hopeful sign that fair food is a social movement in the process of maturing. That people travelled so far to learn about the potential of a food policy council is a sure sign of this.